Let me first start off by saying what a pleasure it is to have the opportunity to be able to caterer for the lovely people of Stowmarket. It is a wonderful small part of the Great Britain map, situated in Suffolk between the busy route of the A14 between Ipswich and Bury St. Edmunds. Stowmarket also offers the Museum of East Anglian Life, were you and your family can discover the history and beauty of East Anglian Life on its 75 acre land with over 3km of woodland and trials. We have a population of approximately 19,000 people. 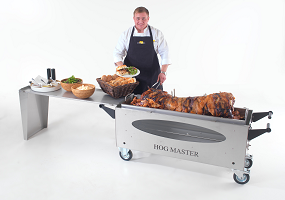 And with the weather generally been quite warm, who wouldn’t want to celebrate with a traditional hog roast! I have been a caterer for Taste the Cracklin in Stowmarket for over five years and I wouldn’t look back, every day is different and there is just something special about feeding people with great food, and I enjoy every moment of it. The small market town based in Suffolk is such a quaint and beautiful place and the people make you feel extremely welcome. We always receive such great feedback from our customers and even repeat bookings which is great as building more and more relationships. As a cater for Taste the Cracklin, I strive to make sure that whatever the event everything is up to our high standards and that the guests are 100% satisfied with our catering ability. Guests can choose from an array of menus from our website which can be tailored for your event. We offer a vast range of accompaniments to go with our hog roasts such as canopies, salads, vegetables and devilish desserts if you’re still feeling peckish! You can even rent a hog roast machine from Taste the Cracklin if you would rather take control of the cooking. We call it the D.I.Y technique, if you think you have the skills of carving a pig then why not try it today? You can hire the machine with the meat included and all of our prices here at spitting pig include delivery, collection and also gas to fire the pig up! The machines from Taste the Cracklin are of an exceptional quality that cannot be matched anywhere else. The machines are all CE registered so you can rest assure you are getting a high quality, brand new, tried and tested hog roast machine. We only use the highest quality ethically sourced meats at our catering events, so that guests get the best taste sensations possible. We would arrive 6 hours earlier to your venue; this is because the pig needs to be cooked slowly for the taste to be sensational. Your guests can also watch the pig while it is cooking which is always nice for them to see what they are going to be devouring later. While the enticing beautiful aromas of the hog roast drift through the air the guests are always congratulating us on the quality and smell of the hog roast, this is the reason why we are the best hog roast service in Stowmarket and the reason why we are so popular. Remember when our fully trained, dedicated team turn up at your event, please feel free to ask them any questions you may have about our services or if you require hints or tips on how to produce the crispiest of crackling, they would be more than happy to do so. Being a caterer based in Stowmarket means I go to many different events including weddings, parties, christenings and corporate events, these are different sized events but the quality always remains the same. No event is too big for us here at Taste the Cracklin and we will happily talk you through the different options available, so that you are left feeling 100% satisfied with our services. If you are going to throw an event and need catering then look no further. You can fill in the catering enquiry form on the website and one of our dedicated staff will be in touch with you, or you can give us a call us.